After much research and a personal journey with our own pets, Pawfect Manners now wholeheartedly supports Prey Model Diet feeding over any other sustenance choice for your cats and dogs. 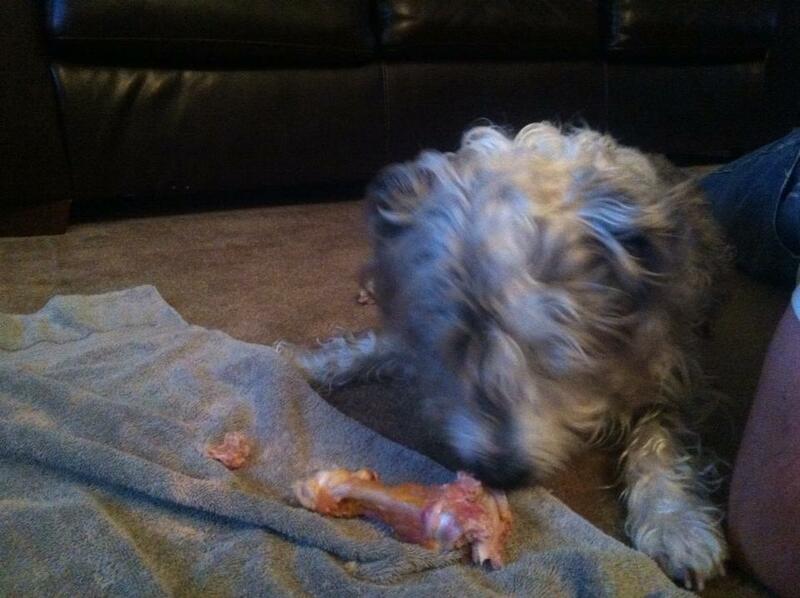 Sadie eating a turkey breast bone. The answer is very simple….because it is what dogs and cats are built to eat. Despite the extreme marketing by dog food companies and animals health “experts”, we must remember that the same marketing strategies are used with processed, highly sought after, and extremely unhealthy foods for people as well. What is better for you? Del Taco or Taco Bell? Well, many would say Del Taco because they have a better reputation for fresher, higher quality meats and fresher vegetables. My response? They are both still fast food!!! Instead, why don’t you create your own healthy and wholesome meals? Even the same meal that you buy at Taco Bell and Del Taco can be made healthier at home. Most of us know this and participate in this to some degree…especially in health conscious Southern California. So, why don’t we employ the same mindset towards our animals? 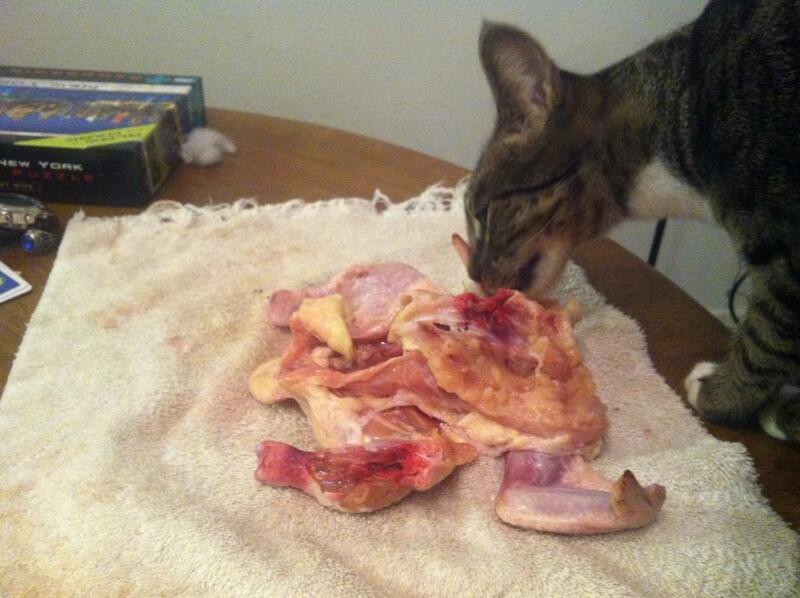 Kitten eating a cornish hen. In our experience so far, it has been significantly cheaper to feed our cat and slightly cheaper or the same price to feed our dog. Both our cat and dog were on high quality commercial foods before switching to Raw Food. How Will Our Blogs Help? Pawfect Manners Dog Training plans to release regular blogs helping people learn about, understand, and feed their animals raw food. We also plan to release twice weekly blogs sharing our favorite sales that can be utilized for raw feeding. If you have questions regarding raw feeding, please feel free to post them in the comments and we will answer all questions. What Blogs Have you Written? I will be posting a blog containing information on that soon! However, rest assured that my cat and dog are both safer eating raw food than they are eating kibble or canned food. Parasites are only found in the GI tract of animals and therefore unless you feed the GI tract of an animal there is nothing to worry about. I have seen far more clients come to me whose dogs have worms from exposure outdoors than due to any source of food. As for diseases like salmonella, studies have shown more than 1/3 of dogs and almost 1/5 cats contain salmonella as part of their normal gut flora regardless of the food they eat. Processed dog food is recalled on a regular basis for salmonella and other diseases. These recalls, however, are for human risk, not dogs and cats. You are less likely to poison your dog with food when feeding raw food appropriately than when feeding kibble. I will post an entire blog about this and link it to you in another comment here when finished! « Our Quarantine – It’s Over!